Exercise Advice: Sit at the end of a flat bench while holding onto a dumbbell. 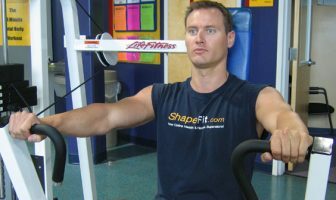 Slowly lean your upper body down as displayed in the exercise photo. Keep your arm tucked into your side at a 90 degree angle. Slowly extend your arm out and keep your elbow in. At full extension of the movement, make sure to keep a little bend in your arm and all the tension on your triceps muscle. Slowly lower the dumbbell back to the starting position. Repeat with your opposite arm.